Why eating breakfast is not the most important meal? Eating breakfast may not be a good strategy for weight loss. There is no good evidence to support the idea that eating breakfast promotes weight loss or that skipping breakfast leads to weight gain, according to a new study led by SPHPM’s Katherine Sievert and Professor Flavia Cicuttini that was published in The BMJ. The researchers stress that the quality of studies was low, so the findings should be interpreted with caution, but say that their review of the evidence questions the popular belief that eating breakfast can help with weight control. 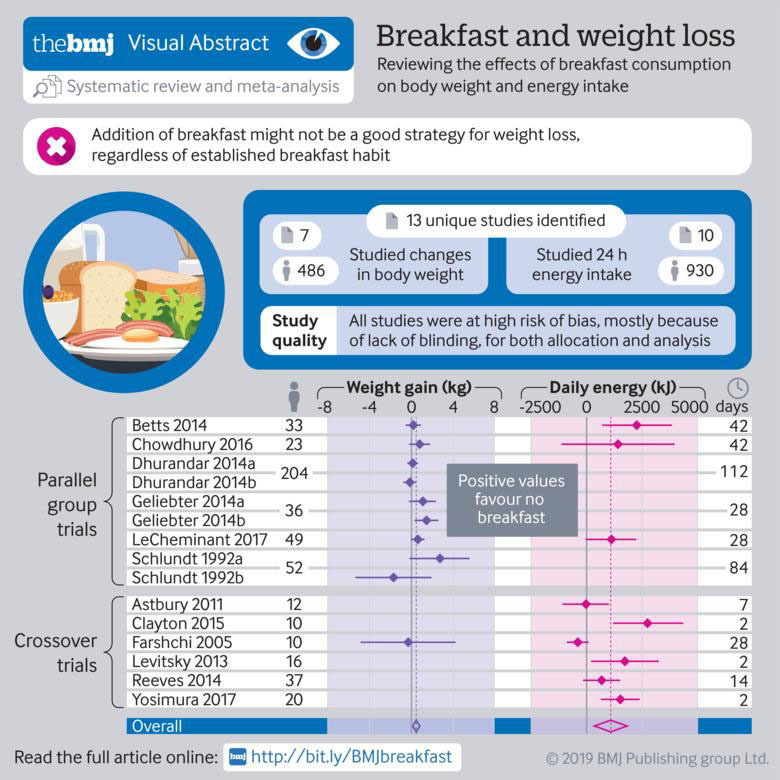 The team analysed the effect of regularly eating breakfast on weight change and daily energy intake, based on evidence from 13 randomised controlled trials, mainly in the US and UK, from the last 28 years. The researchers found that total daily energy intake was higher in groups who ate breakfast compared with those who skipped it (an average of 260 more calories consumed in a day) regardless of their usual breakfast habits. And the results showed that those who skipped breakfast were on average 0.44 kg lighter. It has previously been suggested that eating breakfast may help with weight loss because of the efficient burning of calories early in the day preventing overeating later on. But the reviewers found no significant difference in metabolic rates between breakfast eaters and skippers. In a linked opinion piece, Tim Spector, professor of genetic epidemiology at King’s College London, says that people have different preferences for when they eat food, which "might suit our unique personal metabolism." “No ‘one size fits all,’ and prescriptive slow moving diet guidelines filled with erroneous information look increasingly counterproductive and detract from important health messages. While waiting for guidelines to change, no harm can be done in trying out your own personal experiments in skipping breakfast,” he concludes. Research Assistant Katherine Sievert is a Monash Master of Public Health graduate. You can see more about her work in this video.